January 22, 2018 - "Industry Insight"
The need to mark parts or assemblies with some sort of identification code is becoming more and more important to facilitate quality control, supply chain management, brand protection, recalls and regulatory compliance. Such marks range in complexity from a simple colored dot to provide a visual indication that a part has completed a process, to an alphanumeric date code or serial number, to 1D and 2D symbologies, such as bar codes or Data Matrix codes. Ideally, manufacturers would like to place such marks directly on a part or assembly, rather than apply a label, which can be damaged or come off. In some cases, the same identification codes are used during and after assembly—so-called cradle-to-grave marks. In others, the codes only need to be visible during manufacturing. And, in some cases, manufacturers want identification codes to be invisible to the naked eye to prevent counterfeiting. Ranging from manual stencil printing to laser engraving, there are myriad technologies for marking identification codes on products. No one supplier offers them all. Most concentrate on only one or two. As a result, objective information for choosing the best marking technology for an application can be hard to come by. This article will attempt to remedy that. Marking technologies can be categorized into two broad groups: contact and noncontact. Contact methods include ink transfer, chemical transfer and mechanical indentation. Noncontact methods include ink-jet marking and laser engraving. Each technology is unique and has its own advantages and disadvantages. There are many types of ink transfer technologies: wet-ink reciprocating coders, offset printers, thermal transfer printers, thermal direct printers, pad printers and stencil printers. With wet-ink reciprocating coders, ink is stored in a reservoir. The marking head first contacts the reservoir, then inverts and extends to contact the surface to be marked. The mark is produced with a rubber stamp. Marks can be alphanumeric text or symbols, such as circles or arrows. With offset printers, ink stored in a reservoir wets a transfer surface. A marking head (typically, a rubber stamp) picks up ink from the transfer surface and applies it on the surface to be marked. Some offset markers are roll-type coders that roll-print a message along a flat surface as it passes by. Other offset markers are benchtop type units. The product to be marked is positioned on a base and the marking head cycles to apply a mark. Thermal transfer printing involves a heated printhead and a ribbon coated on one side with a wax-based ink. The message to be marked is formed in metal on the printhead. To make a mark, the printhead presses the ribbon against the substrate, causing the ink to melt and adhere to the part. Thermal direct printing is a similar process, except there’s no ink ribbon. Instead, the heated die creates a mark in a heat-sensitive film, which is then adhered to the substrate. In pad printing, ink is retained in a reservoir that applies ink to a die with the message etched thinly into its surface. Next, a silicone transfer pad presses down on the die, causing the ink to transfer from the die to the pad. The pad then presses down on the substrate, transferring the ink from the pad to the part. In stencil printing, an image is created in a stencil. The stencil covers the substrate and ink or paint is applied to the part through the open areas on the stencil. In chemical etching, conductive metals are electrochemically etched by applying an electrical charge to a chemically treated surface with a stencil die that reflects the message to be etched. Parts must be cleaned first and then a masking die of message format must be affixed to the surface for electrolyte application. The electrical charge can remove from 0.0001 to 0.01 inch from the surface material, depending on the metal and how long the charge is applied. Other contact marking methods don’t involve inks or chemicals. Rather, they engrave or emboss marks into the surface of the part. These methods include impact marking, dot-peen marking, stylus marking, and hot-stamp marking. In impact marking, an embossing die—typically made from a hard metal—is pressed into the substrate with a great amount of force, leaving an impression in the surface. The die can be a set of metal stamps with alphanumeric characters, or special dies can be made with a specific message, such as a logo. substrate to leave a message composed of small indents. Critical to visibility is shape, depth, spacing and size of the indents. Stylus marking is a similar process. However, instead of peening the surface, the hardened metal tip is used to scribe a line for a visible impression. As with dot-peen marking, the shape, depth, spacing and size of the impression is critical to visibility, since ambient light is typically used to discern the message. Hot stamping, or branding, is similar to indent marking, except that the metal die is heated. In some cases, particularly if speed is an issue, a noncontact marking method is the way to go. There are two main types: ink-transfer methods and energy-transfer methods. The most common ink-transfer technology is ink-jet marking, in which tiny droplets of ink are sprayed onto the substrate. There are two types of ink-jet technology: continuous and drop on demand. substrate moves past the nozzle. In other words, CIJ technology can only form characters when the part is moving past the nozzle. In the drop-on-demand (DOD) method, the ink is only sprayed when the message calls for the droplets to mark the message. DOD has an array of nozzles to spray ink without deflection. However, like CIJ, the surface to be marked must be in continuous and steady movement. Some special ink-jet machines can apply four-color images using UV-curing inks for a very durable image. If all that’s needed is a dot, a spray marker is a good noncontact option. Ink is retained in a reservoir and when a mark is required, a valve is opened to pressurize the ink for spraying through an orifice to coat the surface to be marked. The resultant image is a dot if the component is stationary or a line if the part is moving. The most versatile—but also the most expensive—marking technology is a laser. With this technology, a high-energy beam of light is focused on the part and the message is ablated or burned into the surface. In some circumstances, the surface material is oxidized, leaving a dark impression. Or, the laser can be used to remove a coating to leave an image below. impressions in harder-to-etch materials. Each laser is steered by mirrors mounted on motors to produce marks quickly. The laser beam is focused through a lens to concentrate the energy for burning an image. Most marking technologies can be used with a wide range of materials, including plastic, metal and wood. Ink-based processes can have problems with certain materials, such as polyolefin plastics. Their surface energy is poor for chemical bonding and must be enhanced through chemical etching, corona treatment or plasma treatment. Similarly, few processes can be employed to mark glass, which is difficult to bond. Lasers have found some application with hard-to-mark surfaces. 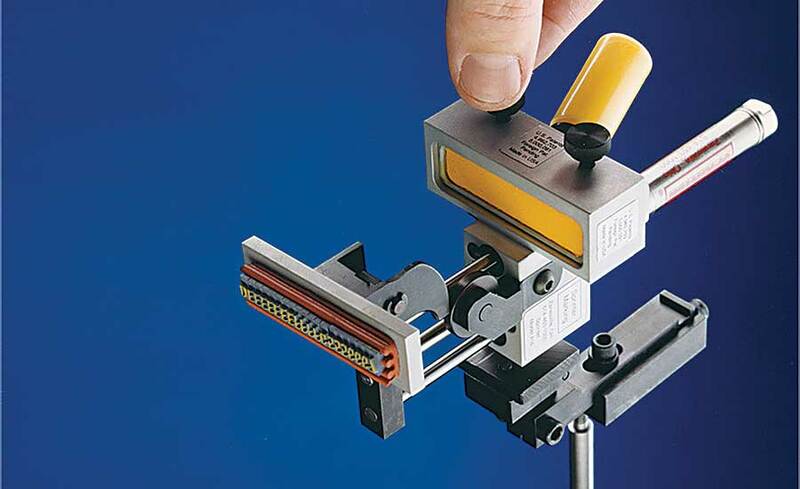 Noncontact marking systems are commonly used for delicate parts. Very hard and fragile surface materials, as well as distortable surfaces, can eliminate impact marking technologies from consideration. Soft materials are also difficult for indenting processes. Another factor to consider is the porosity of the material, particularly for ink-based methods. Often, the ink will depend on the porosity of the material for drying and adhesion. In some cases, very porous materials, like low-density rubber, are hard to mark with single application of ink. Some manufactures have found that multiple strikes will make the mark more visible. The nature of the surface itself also makes a difference. Is it flat, rough, textured, curved, irregular, round or coated? In most cases, any marking technology can work with a flat surface. Rough and textured surfaces can limit the effectiveness of reciprocating coders and, in some cases, pad printers, since not enough pressure can be brought to bear to extend the ink-laden transfer pad into the recessed areas. Curved and irregular surfaces generally present problems for reciprocating coders. In some cases, suppliers can modify the marking head and ink reservoir to accommodate these variations. Pad printers can often accommodate these surfaces, and ink-jet and laser markers are largely unaffected by these conditions. Irregular surfaces can be marked with all the noncontact systems, as well as dot-peen and stylus systems. Other contact marking systems are generally limited in capability, because the transfer surface cannot be made to conform to the surface to be marked. One exception to this is offset marking machines. They can print a range of complex geometries by moving the product to be marked manually over the impression. Small diameter products can be more difficult than larger diameter objects. The direction of the print, either around the product or along its axis, can present problems that may require special considerations, such as rotating the product or special marking head designs. Coatings can be a problem for contact marking systems, as the coating can mask surface conditions. In some cases, the coating can actually track back into the ink or chemical delivery system. It is recommended that the surface to be marked be cleaned at least in the message area. Laser systems get around this problem by burning off the coating and the substrate to leave a message. The temperature of the application can make a difference. If the product will be subjected to high temperatures, ink may not be an option. Inks are typically limited to temperatures of 300 F. Some special-purpose inks are available with much higher temperature resistance, but these tend to be quite expensive. Impact and laser marking are unaffected by heat. Conversely, most marking technologies can be used with products that will be exposed to cold temperatures. wet-ink coders have a minimal work envelope. Noncontact technologies tend to be small and offer versatility in mounting position. In some cases, the unit creating the message is separate from the base machine, which saves space on the line. Ink-jet and stylus machines are good examples. Another key consideration is the production rate. The speed at which the mark must be applied will often determine the method of marking. Is the assembly process intermittent or continuous? At the low end of marking frequency (less than 60 characters per minute) chemical etching, lasers, dot-peen printers and pad printers can be considered. These applications typically require the product to remain in a fixed position during marking. In the medium range (50 to 300 characters per minute), reciprocating coders come in to play. In these applications, the product must usually be stationary during marking. These types of machines can typically be used in processes up to 200 characters per minute. At the higher end of marking frequency, noncontact technologies are most often used. Ink-jet marking systems can be used with the product moving at speeds up to 2,000 feet per minute. Lasers have been used in applications up to 500 feet per minute. Besides line speed, another consideration is how many marks need to be applied. When multiple repetitive marks are required, two or more machines can be gang-mounted and cycled at the same time. Of course, cost is always a consideration. Marking technology runs the gamut from inexpensive stencils to lasers costing more than $100,000. The initial capital outlay is only one component of the cost consideration equation. Engineers must also consider operating costs, such as setup, tear down, operator attention, maintenance and operating supplies. In some cases, the high cost of acquiring a marking technology, such as a laser, can be offset by low maintenance costs and no consumable costs. In other cases, lower capital investment may be offset by higher costs in maintenance and operating supplies. Ink is the most common marking medium, and there are a lot of options. There are solvent-based pigmented inks, water-based dyes, wax-based inks, epoxy-based inks, and UV-curing inks. There are food-grade inks and MIL-SPEC inks. For decorative applications, pad printing in four colors is an option. Lasers can create very detailed images, albeit in one color. Durability is a relative term, since all marks can be removed by abrasion or various chemicals. The most durable marks are produced by lasers, chemical etching and impact markers. Epoxy inks applied by offset printers are highly durable. On the medium side are pad printing, hot stamping and ink-jet marking. The least durable marks are made by solvent- and water-based inks. Drying time is another factor to think about. In some cases, it’s important for ink to dry quickly to accommodate downstream processing. In general, wet-ink coders, thermal printers, ink-jets and chemical etching can be used for quick-drying applications. Pad printing and offset printing have longer drying times, since they use thicker, heavier inks. For some applications, one color is sufficient. For others, more than one color is necessary. Ink-based methods, hot stamping and pad printing offer a range of colors that can make an image stand out from the background. The color of the substrate, its porosity and other surface effects, such as reflectivity, influence the choice of ink color. Light-blue ink contrasts with a range of dark and light surfaces. Pad printing offers a large range of Pantone ink colors for decorative marks. This technology can do single color printing and well as full four-color printing. Laser marking can leave a darker mark if the substrate is burnt off. Otherwise, it leaves a faint impression on the substrate. Impact marking and chemical etching don’t change the substrate color, so the visibility of the marks depends on aggressiveness of these techniques. ink-jet printers, offset printers and stencils to leave a mark that is only visible in the UV spectrum. Most code marking applications—date codes, product codes, lot numbers, pass-fail marks, and logos—tend to be small, requiring less than several square inches. Reciprocating coders, dot-peen printers, ink-jet printers, chemical etching, lasers and pad printers can all be considered. Some dot-peen and thermal transfer machines can mark larger messages over 50 square inches. So, too, can offset printers. When lasers are mounted on an X-Y table, even larger messages can be created. For very large messages, stencils are required. Ink-jet, laser and hot-stamp marking require the substrate to be in close proximity with the marking head, which can present problems with clearance in certain applications. Impact markers and pad printers can be set back from surface to be marked. In many cases, these technologies can be adjusted to allow marking in recessed areas. For repeating messages, both contact and noncontact systems can be used. If the application requires a changing message, such as serial numbers, choices are more limited. With wet-ink coders, offset printers, thermal transfer printers, impact markers, pad printers and chemical etching, the marking dies must be changed manually. With ink-jets, lasers, dot-peening and stylus marking, message changes can be made on the fly. Any of these technologies can produce sequential marks, such as serial numbers. In general, marking is a safe process, but there are a few issues engineers need to consider. One is chemical safety. Inks are formulated for visibility, durability, drying time, adhesion and regulatory compliance. Ink is formulated with a carrier to allow flow and adherence of pigments and dyes. There are numerous grades of carriers. Water-based inks have little or no volatile organic compounds (VOCs). Solvent-based inks have higher levels of VOCs. Chemical etching can involve a range of solvent-based chemicals, depending on the material to be etched. Laser marking does not involve chemicals, but off-gassing of various compounds can be aggressive, depending on the base material. Impact marking does not produce air-borne particulates. Engineers also need to consider the environment that marking machines will operate in. Humid or dusty environments can affect the ink-based processes. So, too, can large temperature fluctuations. If marking machines are installed on or near vibrating equipment, this may affect mark quality. In many cases, customer requirements are quite specific, and the guidelines outlined in this article may not be applicable to every circumstance. Engineers are well-advised to seek the expertise of reputable suppliers. Many suppliers will test your part marking application with their equipment before you commit to buy. In summary, selecting a code marking technology can be quite a complex process. In some cases, engineers may find that multiple technologies are capable of making a desired mark. It then becomes difficult to decide which technology can produce the highest quality mark, in the most reliable manner, at the lowest cost. Engineers should consider the initial capital cost, as well as the total cost of ownership. For more information on part marking technology, call Sprinter Marking at 740-453-1000, e-mail sales@sprintermarking.com, or visit www.sprintermarking.com.